I Ellen Callahan of Cuyahoga Falls, Ohio, being of sound and disposing mind and memory, and wishing to dispose of my worldly effects do make and publish this my last will and testament. Item 1st. It is my wish that all my just and legal debts and funeral expenses be paid and discharged. Item 2nd. I will devise and bequeath to my brother Orville Howe and his wife Julany, if they survive me, a life estate in the following described real estates. Situated in Cuyahoga Falls, Ohio, and known as Lots one (1) and two (2) Block “E” known as the B—— property; In owning this undivided ½ interest in common therein. Item 3rd. Also, Lots No. 18 in Block “G” and Lots No. 23 & 25 in Block “H”, and situated on the North side of Stow Street. At the death of said Orville and Julany Howe, if they or either survive me, and at my death, if I survive them, then the real estate above described shall pass to and rest in the children of my said brother Orville Howe. I wish Lucius, Mary, Ida, Charlie, Jennie, Minor and Mattie to share and share alike, and if at my death any of said children shall have died, and left children, then such children shall take their Fathers and Mothers interest, as the case may be, but in case there are no children then such interest shall rest in the Brothers & sisters of the deceased. It is my intention to give and devise the above real estate to the children of my brother Orville, subject only to the use of both my brother Orville and his wife Julany and the same is to devise and bequeath to them there heirs and assigns forever. Item 4th. I will and bequeath to my beloved son George Callahan such of my personal clothing as he may desire and one feather bed, the remainder of any personal clothing and remaining dishes I bequeath to the four daughters of my brother Orville named Mary, Ida, Jennie and Mattie or any of them that may be living at my death to be divided equally between them and if they are unable to make an equable division the same shall be made by my executor. Item 5th. I will and bequeath to my son George, my gold watch & chain, to use during his life and at his death to pass to, rest and become the property of his eldest child if he has any. If not to pass to and rest in the eldest living child of my brother Orville. Item 6th. I will devise and bequeath the homestead upon which I now reside, being known as Lot No. 14 and 15 in block “E”, Cuyahoga Falls, O. together with other property of every kind and nature, personal or mixed including household effects, notes, money and credits that I may have possessed of at the time of my death, to Miner H. Howe and Thos. F. Walsh in trust for my said son George during the period of his natural life and the same shall then pass to and rest in the children of my said son George begotten by him in lawful wedlock their heirs and assigns forever. But in case there are no children of my said son George, then the property above devised to said brother shall pass to and rest in the children of my said brother Orville their heirs and assigns forever, share and share alike. It is my wish that my said son should at all times occupy the homestead, occupied by me and him, such further use of my property and the earnings and interest there of, and in such amounts, manner and at such times as in the judgment of the above trustees may be best, wise and proper, considering the habits, ways, mode of living of my son George and his industry, sobriety and ability to have and manage. It is not my wish that my son should at any time want, and to have confidence in the trustee above named, carrying out my wishes, but I want the property so that it cannot be lost, squandered or destroyed or marked by any creditors of my said son, and I give and grant to said trustees the right to sell, buy or invest my said property in such way or manner as in their judgment may be wise and proper for the purposes herein set forth, and required that before making any important loans, sale or purchase, that they consult with the Probate Judge of Summit County concerning same. I appoint Thos. F. Walsh executor of this my last will and testament. In witness where of, I have hereunto set my hand and seal to this my last will and testament this 8th day of January 1891. There is a small section of writing that occupies the lower section of the will. Some of it is unreadable and so it’s contents unknown. What can be deciphered indicates that some article or item was to pass on to Bertha daughter of Mary Milward if Ellen’s son George had no children. Mary is the daughter of Orville Howe. The will is signed by Ellen Callahan. In item 2 Ellen creates a life estate for her brother Orville Howe and his wife Julany in lots 1 and 2 of block E and known as the B—- property. This life estate is to be held by Orville and Julany as an undivided 1/2 interest in common. Or Ellen is trying to say that she only owns an undivided 1/2 interest in common. The map of 1891 clearly shows lots 1 & 2 belonging to J H Somers. 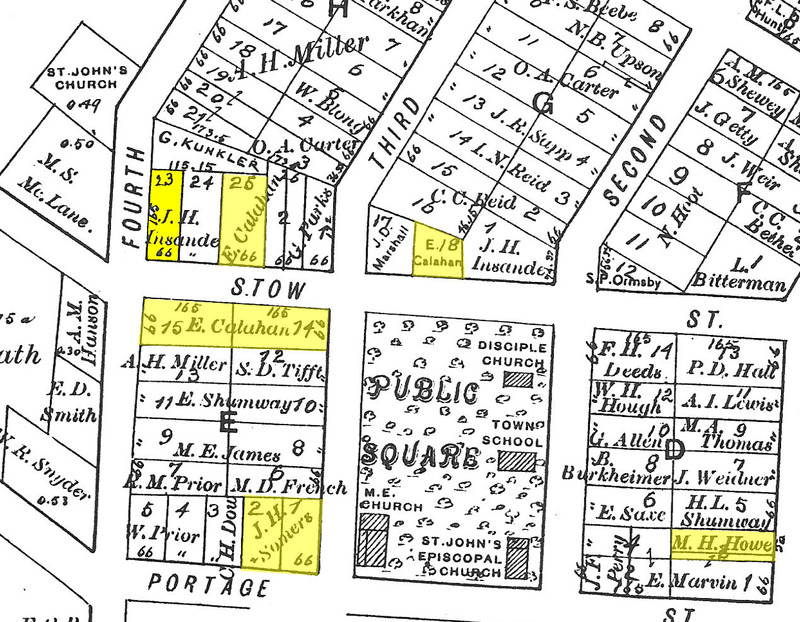 In item 3 she creates another life estate for Orville and Julany in lots 18 of block G, lots 23 and 25, of block H and situated on the North side of Stow street in Cuyahoga Falls, Ohio. She specifically states that upon the death of Orville and Julany Howe The properties shall pass to their children and if any of them are dead it shall pass to the children of those who are dead. The 1891 map shows lot 23 belonging to J.H. Insande and lots 18 and 25 owned by E Callahan. In Item 4 Ellen provides for her son to have her gold watch and chain and creates a trust in lots 14 and 15 in block E as well as all her property. the trustee’s are her brother Minor H. Howe and her Attorney Thomas F. Walsh. She then appoints Thomas F. Walsh as the executor of her will and gives some instructions to the trustee’s on carrying out her wishes. 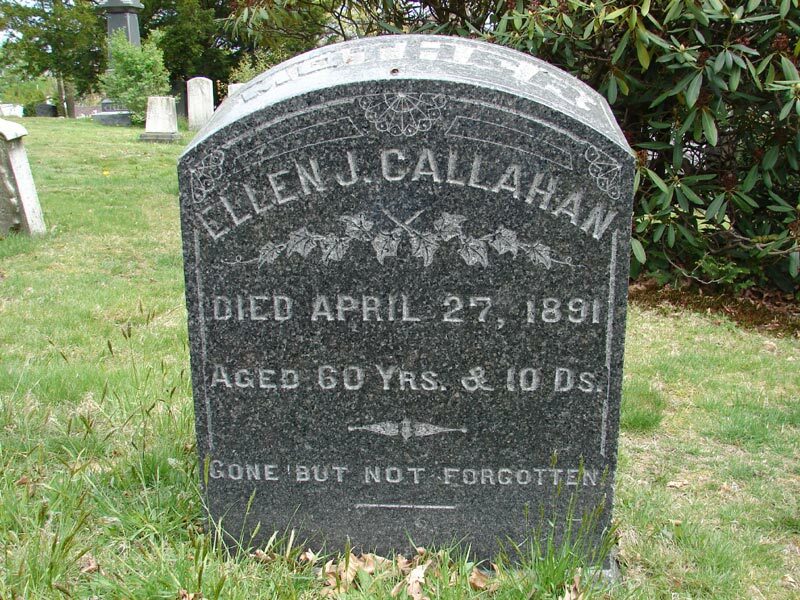 The probate record of Ellen Callahan confirms Thomas F Walsh as the executor and teamed with Minor H. Howe as trustee’s. There were debts totaling some $1700.00 and also some uncollected assets. These uncollected assets were debts owed to Ellen but were deemed uncollectable do to the loss and expense to the estate to collect. G. Callahan signed the accounting record as being satisfied.